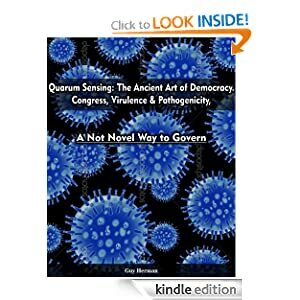 Start reading Quorum Sensing on your Kindle in under a minute. Don’t have a Kindle? Get your Kindle here. Borrow this book for free on a Kindle device with Amazon Prime. Buy a Kindle today and start your Amazon Prime free trial to borrow this book at no cost. The mechanisms of everpresent bacteria in the human body mimic much of our own human behavior, when we act. Pathogenicity, the call to arms for men at war, bacteria hungry for lunch, humans husbanding individual strength for collective undertaking,defines the tipping point or critical mass required to engage an army of hundreds or thousands to infect a body, plant crops, harvest, make effective civil structure, or in the case of 21st Century man and Congress, fail at the collective endeavor of acting in unison and for the commonwealth.